Hi Pete, big thanks for all the info you provide on the TOS platform as I’ve found it super helpful. I’m trying to create a watchlist column for an hourly timeframe that shows me the type of candle and whether the price is increasing or decreasing. The code below works great on daily, weekly, monthly, etc timeframes but I provides inaccurate data for anything shorter than a day. Do you have any hints or ideas on what I’m doing wrong? I’ve included an example screenshot. Check your chart settings. There is a setting named “start aggregation at market open”. The default value is checked. 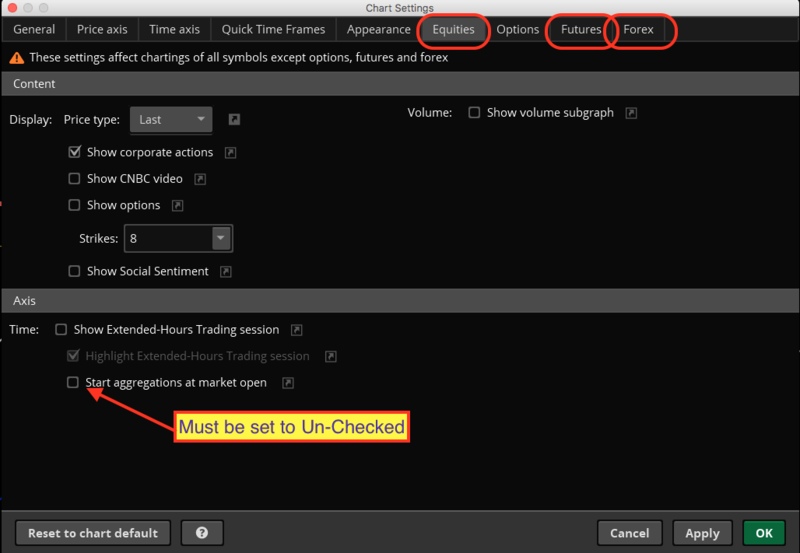 You must uncheck this before your charts will align with any of the other tools on the platform when working with intraday time frames. This question has been posted before. Screenshot below shows where to locate the setting.